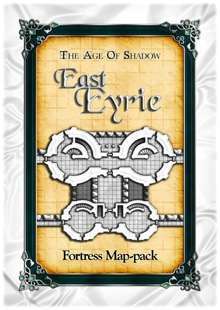 In this map pack you will find more than forty maps that depict the general layout of all the major structures within the great elven fortress of East Eyrie. All of the maps have been presented in a semi-modular fashion so that they can be used to represent a wide variety of different buildings within any fantasy/medieval fortification - thus allowing GMs to utilise these maps in whatever manner (or campaign setting) they see fit. In addition, a brief history has also been included to provide a little background information relevant to the Age of Shadow campaign setting (for those games where it is intended to be used as such), though this has been kept purposely brief (and system neutral) so as to not impede on this product's primary function as a map-pack. Is "Eyrie" just poetic license for the altitude at which this castle sits, or are there landings and "stables" for giant birds or other winged mount of some kind? It's the former I'm afraid (i.e. it's fairly mundane in its design). All the other fortress map packs specifically state there are jpg files included for vtt use. I do not see this feature listed in product description or review of this pack. Does this pack include jpgs? I will look over your excellent offerings for the best fit(s).